Sachio fujioka was born in Tokyo in 1962 and from the age of 4 studied piano, of 10 studied chello and from age of 16 studied conducting. From 1987-90 he was assistant conductor of Japan philharmonic orchesutora. In 1990 he moved to the UK on taking up post-graduate studies at Royal Nothern College of Music in Manchester, where he was the first holder of the Sir Charles Groves Conducting Fellowship. 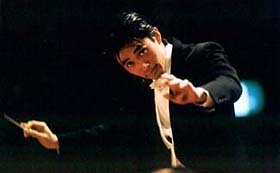 Sachio Fujioka is now based in UK where between 1992-1995 he was Assistant Conducter of BBC philharmonic Orchestra. Following his very successful debut with the Japan Philharmonic Orchestra at the Suntory Hall in Tokyo in May 1995, he was appointed as a regular conducter and now returns to work with the Orchestra on a number of occasion each season. Following his debut with the BBC Philharmonic in November 1993, Sachio Fujioka has since appeared with the orchestra at the BBC Promenade concerts in London and has also made a number of recordings with this orchestra for Chandos records. He also assisted Sir Georg Solti on numerous occasions when working with the BBC Philharmonic in such repertoire as Bruckner and Strauss. 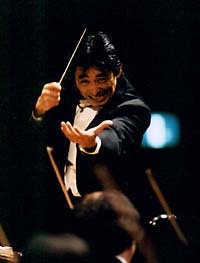 At the begining of the 1995/1996 season , Sachio Fujioka commenced his five year appointment as Principal conducter of the Manchester Camerata and has conducted numerous concerts with the orchestra in their new home, the Bridgewater Hall. In the 1998/1999 season he and the orchestra undertook a highly successful tour of Japan including appearances at Tokyo Opera City Concert Hall,Tokyo. Recent/future engagements include return visit to Japan Philharmonic Orchestra, the Bournemouth Symphony, BBC Philharmonic , debut with the Royal Philharmonic ,the Royal Liverpool Philharmonic, Ulster Orchestra, National du Capitol de Toulouse, the Halle Orchestra, Norrkopings Symphony, Sweden and the Winterthur Orchestra, Swizerland. In 1999 he made his debut in Australia, in which he had considerable success, which has resulted in re-invitations for concerts in 2000 and 2001. In addition , Sachio Fujioka has also recently been appointed to the position of Principal Conducter of Kansai Philharmonic Orchestra in Japan. Sachio Fujioka has made 6 CD with BBC Philharmonic on the Chandos label.